Elance Hiring Calculator | Noble Studios, Inc.
What if filling out complicated forms could be transformed into an interactive experience? That’s the approach Noble took for Elance, a site that brings together freelance artists and writers with clients looking to hire them. What resulted was a visual experience built to encourage users to post jobs and connect with the right person for their project. 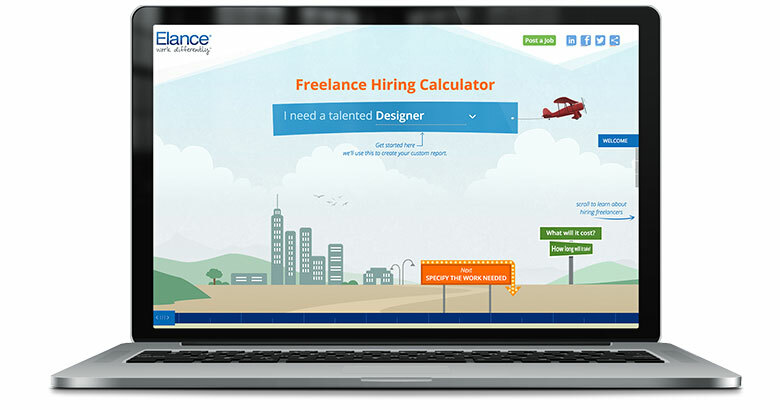 From this thinking, the “Freelance Hiring Calculator” was born. Instead of a long, drawn-out HTML form that might cause users to abandon the effort quickly, we conceived a visual journey that told a story while educating users along the way. Game-like in its feel, the hiring calculator starts by asking what sort of work the potential customer needs done. It then walks them through a series of questions featuring colorful drop-down menus, selectable bubbles and sliders that allow the user to set their budget and timeline. Along the way, facts about Elance and its pool of talented creative are sprinkled throughout the journey. A visually appealing interactive tool draws clients in and gives them control over the results. As the client completes the task, they are shown relevant stats that illustrate how Elance helps people just like them. Upon completing the questions, users are invited to share their email address to receive a customized PDF report. Once they’ve completed the journey, the user is instantly emailed a customized report that gets straight to business. Feeling more like an infographic than a static list, the report details a list of recommended freelancers and their going rates. 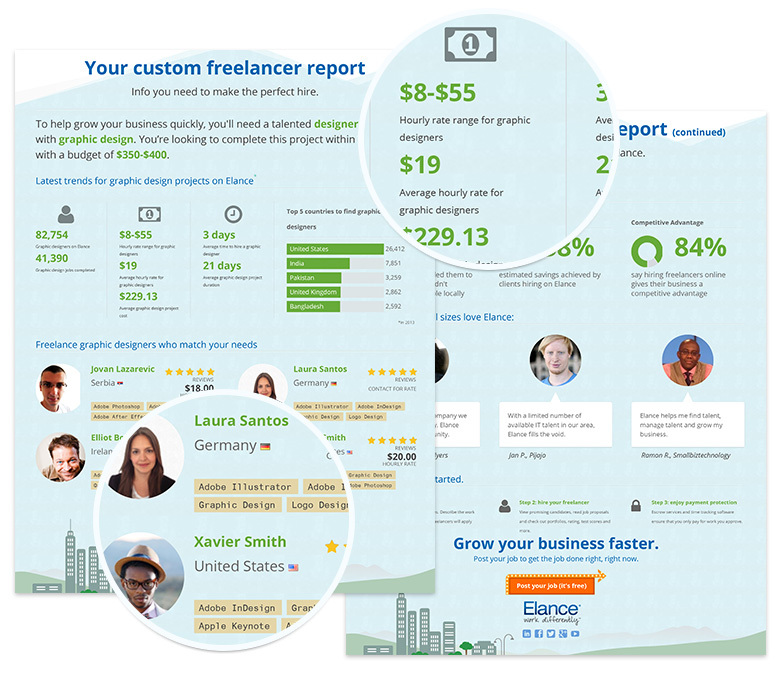 The client can easily compare qualified freelancers side-by-side and make decisions based on ratings, cost and skillsets. Clients can even see what the freelancer looks like, bringing a human element into the mix. The report is also peppered with useful, educational points such as the trends in freelancer pricing as well as testimonials from other real-life Elance clients. Near the bottom of the report, clients are given tips on making the most of hiring a freelancer followed by clear and direct calls to action to take the next step.